Regular Coffee Named One of the Top 50 Places to Buy Coffee Online – Regular Coffee Co. 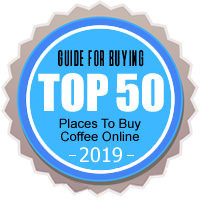 Regular Coffee was named one of the top 50 best places to buy coffee online in a recent article from Guide for Buying. Thanks, Guide for Buying! Regular Coffee came in at number 4 on the list (but note that the article doesn’t specify whether the list is ranked or not, and it doesn’t appear to be). We only sell one variety of high-quality 100% Colombian coffee at Regular Coffee (although we offer it in several different forms, including whole beans, ground, and K-cups), so you can tell our single variety along with our website, brand story, and customer service team did some heavy lifting to get us noticed on this list. It just shows you don’t have to be a coffee snob to source and deliver balanced, approachable beans that keep it simple and still turn heads.